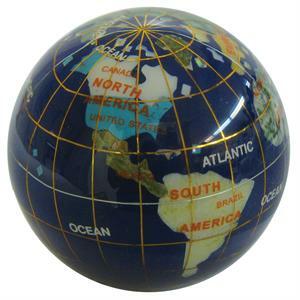 Item #CC-GPW-65: 2.5" diameter royal blue globe paperweight with reconstituted Lapis Lazuli with beautiful gemstone materials used to inlay the continents and islands. Thick coating of clear lacquer protects gem materials and gives the globe a shine. Item #CPW-5: Natural Onyx colors; 5 x 3" tall. Item #EPW-5: Natural Onyx colors; 3 x 3 1/2" tall. Item #FEPW-5: Natural Onyx colors; 3 x 3 1/2" tall. Item #PPW-5: Natural Onyx colors; Round body on short legs, with big ears; 3 1/2" tall. Item #PW-2: Set of twelve 14-sided 1 1/2" Onyx Paperweights. Item #PW-2: Two 1.5" wide, 14-Sided, natural Earthtone colors Mexican Onyx Paperweights. Item #PW-5: Earthtones; 3 1/2". Item #MI-731: 2.25"x2" Rutilated Quartz Heart Paperweight of 416.15 cts. 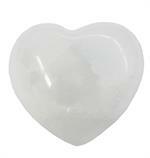 Item #MI-728: Our Satin Spar Heart Paperweights are available in two sizes. Please choose your desired size below. Item #WPW-5: Natural Onyx colors; 4 x 3" tall.